Long answer: inflation is a staple of a healthy economy, and contrary to what you may think, it's not a bad thing. In fact, inflation is normal in a healthy, growing economy - and an economy without inflation will encounter problems. First, supply and demand increases the cost of goods. In a fast-growing economy, demand is higher than supply. This means that the cost of good will naturally increase. The result is that the same goods cost more over time. In other words, inflation occurs. Second, higher wages. Unemployment drops as more people find work in a high-growth economy. Across-the-board increase in wages generally results in higher inflation. 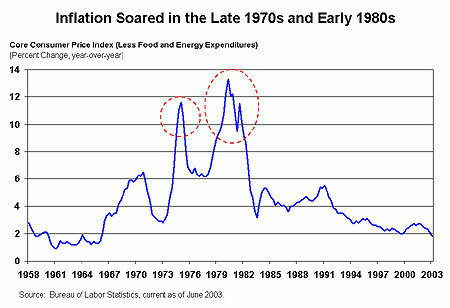 During the 1970s, the U.S. experienced "stagflation" (a stagnant economy with high inflation). During this period, economic growth was very low, but inflation was very high by historical standards. Similarly, you've probably heard stories of massive amounts of inflation in places like Zimbabwe and Sudan, which have experienced inflation rates of tens of thousands of percent per year. 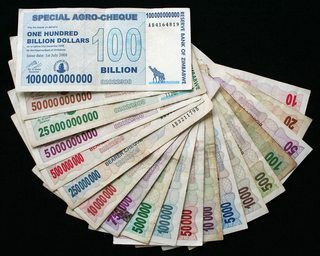 In the late 1990s, Zimbabwe was printing 100 billion dollar bank notes! At this rate, cash is basically worthless as its value is not predictable day-to-day. These economies are in trouble -- they typically switch over to more stable currencies such as USD, as Zimbabwe began doing in 2009. In most modern economies, a central bank sets goals for inflation. This is known as "inflation targeting", with the goal of maintaining price stability within the economy. These central banks mainly use interest rates as a monetary instrument to control inflation and other aspects of the economy. The central bank of the U.S., called the Federal Reserve ("the Fed" for short), began to issue public inflation targets only in 2012. As we approach 2020, keep an eye out for how central banks continue to monitor economic growth and handle inflationary pressures in their economies!